New Bollards Direct supply a wide variety of removable hoop barriers or lift out hoop barriers that are an ideal solution for securing large perimeters such a car show rooms, forecourts, shop fronts and car parks where access control is required. 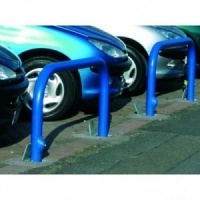 Hoop barriers may be used to restrict the access of vehicles or to indicate a clear and safe pathway for pedestrians in areas where a large amount of vehicles may be, such as car parks, retail parks and supermarket forecourts. 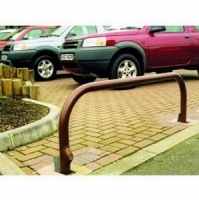 Our removable hoop barriers are manufactured from heavy duty steel for strength & stability and are available in two sizes and many different finish. Rhino RDB60 removable steel static hoop barrier with a 500mm height above ground, 1400mm length and 60mm diameter. Rhino RDB76HD removable steel static hoop barrier with a 650mm height above ground, 1400mm length and 76mm diameter.